Note: Maria has disappeared from the credits, to be replaced by Des and Daphne hugging. 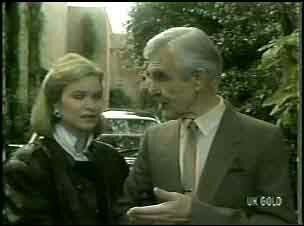 - Helen is offered an exhibition by Douglas. - Max surprises Danny by being good at French. - Scott asks Jim about Grandma Robinson. Jim isn't surprised she missed Paul and Terry's wedding. - Douglas invites Helen out to an art evening. - Terry's ex-husband rings her at No.30 and threatens her. 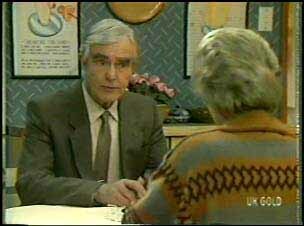 - Max tells Jim that he once did some plumbing work for Douglas - and Douglas is married, not a widower. Jim asks Max if he's sure about Douglas - because Helen is under the impression that he isn't married. Helen and Douglas are looking through her sketch book. She also shows him some other artwork of hers and he is impressed. He says she could do with a better framer, though. He thinks the pictures are all worth exhibiting, except for one that doesn't look quite finished. He also thinks Helen's paintings will sell. Helen says she never dreamed she would have her own exhibition. Douglas says he's pleased to have "discovered" Helen. He thinks she could have a big future. 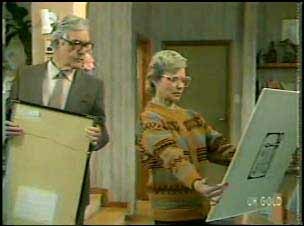 Max shows Jim the receipt for his plumbing job with Douglas. Jim says that Max still can't be sure, but Max says he's sure enough to put a small wager on it if necessary. Max gives Jim Douglas's address and phone number. Terry tells Paul that she loves him and she won't let anything ever come between them. They start to get a bit frisky, but Terry jumps when the phone rings. It turns out to be Paul's work - he has to be in in about an hour or so. He has to go to Singapore again. Terry is very upset, saying she doesn't want to be alone at night. Des is eating breakfast when Daphne comes in from jogging. Daphne says that Des should try jogging, but Des says he would die before he got halfway around the block(!) 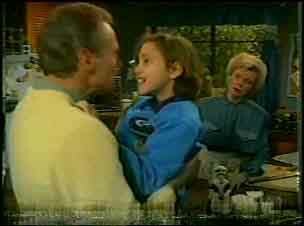 They talk about the ransacking of Des's place again - Daphne will tell Terry later. Daphne tells Des that she wants to tell him a secret. She thinks Terry is still in love with Shane. Des nearly chokes and says that Daphne is way off - Paul and Terry are meant for each other. Daphne says her woman's intuition tells her otherwise. Des thinks Daphne is jealous and tells her not to think along those lines any more. 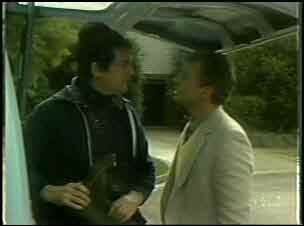 Paul is just leaving and is saying farewell to Terry as he gets into a taxi. 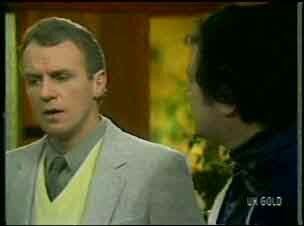 When the taxi has driven off, Terry goes in to see Daphne. Daphne tells Terry that Gordon has struck at the house, turned it upside-down. Terry wants to know everything, so Daphne tells her about the wreath, the bomb-scare and the ransacking of Des's house. Terry is very upset. She says she doesn't want to tell Paul. She says she's not putting up with this from Gordon any more - she can't. She's tired of looking over her shoulder all the time. She wishes Paul was there with her. There a knock at the door and Terry jumps, but it's only Helen. She sees that Terry is upset and Terry tells her that Paul has gone to Singapore. 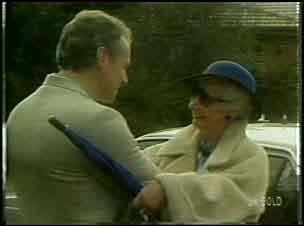 Jim pulls up outside Douglas's house where Douglas is standing with a woman on his arm. Jim asks him for a brief word. Douglas introduces the woman as his sister. Douglas guesses that Jim has come to check on him, but Jim backs out and says it's nothing, really. He heads off. Helen is painting when the telephone rings. It's Douglas - he says that something has come up and he has to have a talk with her. He asks if he can come over. Douglas has arrived. He tells Helen they need to talk about the logistics of doing an exhibition - she'll have to produce more canvases. He says Helen will have to work quite hard. Helen asks if Douglas doesn't think she's up to it. Douglas says that he doesn't know if she'll have time with her family commitments. He admits that Jim came to visit him. Helen says that her life is up to her, not her family. Terry comes in and finds the phone is ringing. It's the dodgy-looking woman from the other day. She pretends to be from Personnel in the airport and tells Terry that Paul has been delayed in Singapore. 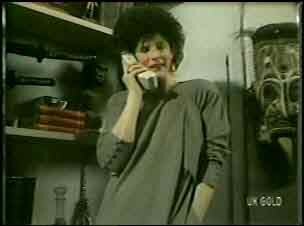 A few seconds later, the phone rings again, but Terry doesn't answer this time. Helen is chopping vegetables in a rather angry way. Jim comes in and Lucy hugs him. Helen sends Lucy off to wait in the car while she has a word with Jim. She says she knows Jim went to visit Douglas today. Jim apologises and Helen says so he should be. Jim said he had good reason at the time, but he's sorry. Helen isn't convinced and says that if Jim had any doubts about Douglas he should have brought them to her. Helen is very angry and storms off. Jim follows Helen out to the car, saying he was only looking out for her best interests. Helen thinks that Jim just doesn't want her to leave the family at all. When Helen has gone, Jim goes over and berates Max. Max still thinks that the woman he saw Douglas with wasn't Douglas's sister, but Jim tells him to drop it. Just then, Jim's mother gets out of a taxi.